Had a great day this morning fishing. Lots of rainbow trout everywhere.used worms under bobbers. The creek I fished doesnt have a name but there is a camping quota of 20 fish per trip. I managed to keep 4 that were panfryers, the rest were too small. Here's some pics. It is in the okanogan. A great little stream with a nice campsite. If you care to share, what is the name of this campsite. I would love to go there. "Had a great day this morning fishing. Lots of rainbow trout everywhere.used worms under bobbers. The creek I fished doesnt have a name but there is a camping quota of 20 fish per trip. I managed to keep 4 that were panfryers, the rest were too small. Here's some pics." Firstly....what is a "camping quota"? SO if I am correct in assuming what it is...you are saying is that the "camp site rules" override the Fish and Wildlife Act and that you are allowed to catch and keep 20 fish? Hmmmm. It doesn't matter if it has a name or not, the rules apply. It is Boundary Creek Campsite. I'm not sure all the details because my buddy took me there. There are brook trout in there too. And what i meant, is that we could keep 20 fish in total for our camping trip. we were there for five days and you are allowed 4 trout per day. NOT 20 fish per day LOL. As I said many times before, call it like it is. This is poaching. 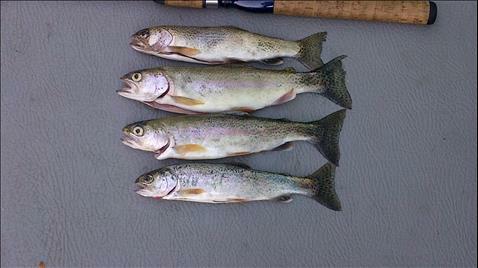 Using bait in a bait ban area, keeping more than your possession quota. This forum continues to take poaching lightly because it is apparently not nice. Poor fish. roe bandit, amazing how you and beak always show up at the same time. you claim you are not connected/same person but I always wonder. boundary creek does not, to my knowledge , meet up with the kettle until it is in the usa. it would, I strongly suggest, be listed separately just as the grandby river is, if it had restrictions/bait ban. I think, as usual, you have made an incorrecty statement only to have your buddy beak add his 1 cents worth (most people are at least worth 2 cents) using the only word he knows. the only time the two of you show up on this site is to rip into someone. (I do recall roe bandit once made a useful post. the same cannot be said for his buddy). why don't you come out of the closet and contribute or do us all a favour and get lost. you two have cost us many great members, members who had knowledge they were willing to share. surprise me! you are very sensitive roe bandit. you and beak do nothing but insult people but you cannot take it. there was nothing in my post about you being gay. the saying coming out of the closet was nothing to do with being gay. and like you said there is nothing wrong with being gay. as for boundary creek, I will let you know when I hear back from the co in Penticton but I think you are wrong. boundary crk meets the kettle south of the border from what I can tell. why would f+w be concerned? the regs, I suggest, refer to the many little creeks that flow into the kettle . if I am wrong I am man enough to admit it. now read my above message without your paranoid approach and you will see that once again I have merely suggested you post something of use. I know you can contribute in a positive way. you have in the past actually shown that you have a lot of fishing knowledge, probably more than anyone else on this site. just show some people (and me again!). do not come one here every 3 or 4 months to tell someone how bad they are. They do have a point though cagey as much as they do bash on people all the time, it is poaching if the person takes more that daily limit, fishes w/out a licence, takes fish that are not open etc. I constantly see it on this site especially, and its brutal the carelessness that goes on. As harsh of a word as poaching is for a mistake, it is still poaching. Seems like the fishing community doesn't take it a serious as the hunting community as a whole, but its all the same and can't be treated lightly or their will be nothing left. total agreement. it is not the message I object to. it is because all they ever donate to this site is "poacher" even though they are not always right. find me one posting by the beak that was not bashing someone. I supported what the other members said. s'slayer nick may or may not have broken the law. the problem is he does not know what the law is. that was fine 30 years ago when there were very few rules and regs for fishing but now there are so many you have to have a set of regs with you at all times and you have to refer to them prior to fishing any body of water. if you do not know what lake or river you are at do not fish. there is no excuse for someone who has made himself out as being an experienced fisherman to do that. I have no problem, quite the opposite, of you or any other contributing member letting someone know in very clear terms when they have broken the law. I have a big problem with someone who is a self appointed "game warden" whose sole purpose is to attack anyone they can. maybe if they contributed a little they could help educate some of those who do not know enough to check first. in this thread the guilty party was quickly and politely asked where he had been fishing and why it was important. a second member pointed out the limit question. 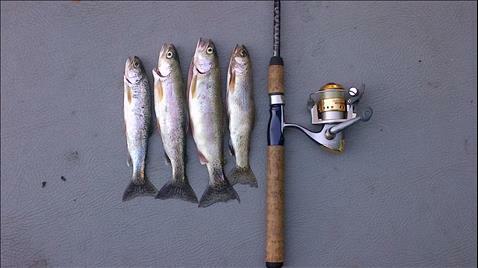 roe bandit , who has only posted once in the last 6 months or more, quickly jumped in the declare a bait ban . I have left two messages for the conservation officers in Penticton who are responsible for the area to find out. I am confident a creek as big as boundary would get it's own listing if it were subject to a bait ban. it is not a tributary to the kettle in bc according to the map I looked at . I know the area well and was actually surprised they joined. there are lots of little tributaries to the kettle on the Canadian side. they are the ones subject to a bait ban. interesting enough the limit on brook trout in that area is 20. one more thing, s'slayer did say the fish were a dinner catch. he might have been more clear but I do not think from reading his story he took more than his limit home. probably none! i agree cagey and i know your frustration i'm almost getting tired of sharing my thoughts on this forum because of all the drama and bickering that goes on here. However i myself was a teen not to long ago, and i see some teens coming up on here that have a passion and like to share as much as possible about techniques on how to target certain fish with them. Heck i'm still learning from the guys that are three times my age. Ive put lots of miles on my boots and jeep to get to know all the spots i know, and i think thats the biggest thing someone can learn. But disregarding the regs gets to me, like you said you should have a set with you were ever you are, there is an app for it as well if you don't want to carry a book with you. no I did not. will try Thursday as I will be home. I am curious too ! I agree but I do not believe he is not a kid. he should know better. at the same time other than me reporting when I hear back from the co let's end this thread. Thats all we were saying the SOA. And I bet you hes older than I am. Doesn't matter you age at all, i'm sure he will check the regs next time. And theres always that chance putting it on a public forum, that when you mess up you will be told. The conservation officers responded. the bait ban applies proving roe bandit correct. this is a prime example of referring to the regulations very carefully prior to dropping a line in the water and if something is not clear contact the co's as described below. conservation.officer.service@gov.bc.ca and title the enquiry "Question" . in the body put your name and phone # as well as details of your question. it says it could take up to 5 days but I had a response this morning from yesterday afternoon. pretty quick response time! if you need to speak to a co just title the email "contact" then explain why. yes it should prove a useful tool to interpret the regs etc. I guess when I found a dead grouse on my front lawn this morning courtesy of one of our cats I should have known crow was on my menu for the day! I hope you listen to my request that you contribute a lot more to this site with helpful tips etc . very well put. salmonslayernick was not dragged through the dirt. most of the thread was roe bandit and myself throwing mud at each other until I proved him correct! his thread was not something that could be ignored. from past posts I do not believe ssn is a kid. he has told us all he is an experienced fisherman. he made a mistake and I hope he learned from it and is not offended by anything said here. hopefully he will feel safe to contribute in the future to this site but will be sure he is abiding by the law! Dennis, the place was Boundary Creek Provincial Park west of Greenwood. Make sure you know what you are allowed to use/catch as "argued" in this thread.